Another month, another couple of articles from the “alternate universe” of Dragonne magazine. As my Patreon followers already heard, what was supposed to be a simple project to do a Baklunish pantheon has morphed into something a bit more grandiose. Now the plan is going to be a whole Baklunish expansion, with gods and monsters and an expansion map and new gazetteer entries and so forth. My gimmick, if you will, is that my imaginary timeline TSR takes the same tack as the real one did before the release of the Monster Manual II and Unearthed Arcana. That is, there were lots of previews of the new material in Dragon magazine preceding the release of the books. I posit that Gary’s planned-but-never-realized Baklunish expansion would have taken the same path, and my faux magazine articles are what we might have seen in that otherwhen timeline. For the sophomore outing, I present three evil Baklunish gods and the spells for the rashaw cleric sub-class that was presented last month. Just a note; that first file has had a few updates, so you might want to download it as well. Enjoy, and as always feedback is more than welcome. Alas, Google Plus – Let’s Try MeWe! Damn Joe I am loving this series. The old Baklun pantheon never looked better. Istus and company never seemed like enough, then Moquol was added by I think Fred Weining or Sean Reynolds? Why stop there? By the way those ads are spot on, they can’t be real can they? Yes, those are actual ads from the 80’s. I was going to do a whole series of fake-but-real-looking-ads, but my artistic skills and time were simply lacking. 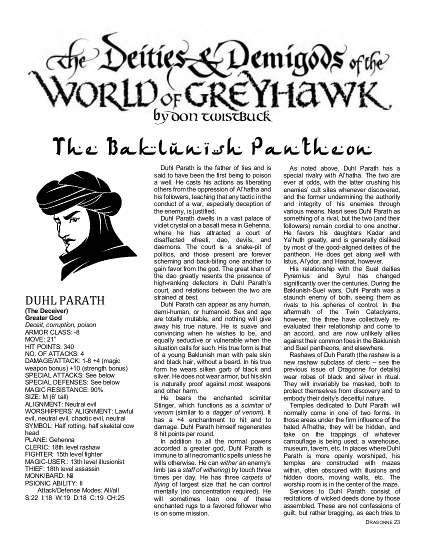 I did “update” the headers of the articles, though, like I did with the Greyhawk’s World series. You do realize that you’re spoiling us, right Mr. Bloch? Another great article-one that gamers and writers alike can use!